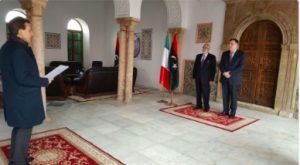 Italy’s new ambassador to Libya presented his credentials today to Presidency Council chairman Faiez Serraj and then went on to the reopening of his country’s imposing white embassy on Tripoli’s Corniche. Giuseppe Perrone’s formal installation marked the climax of 48 hour of diplomatic activity by Italy which saw its interior minister Marco Minniti in the capital to give the PC and Government of National Accord his country’s full backing. He also met Serraj’s two PC deputies Ahmed Maetig and Abdussalam Kajman as well as foreign minister-designate Mohamed Siala. One key outcome for Rome is the agreement to draw up a memorandum designed to address the flow of migrants passing through Libya on their way by sea to Italy. The embassy reopening added strong symbolism to the visit since Italy is the first country to return its diplomats. As Minniti made clear during his visit, in February 2015 Italy had also been the last country to pull its embassy staff out of Tripoli in the face of collapsing security. Most missions had been closed and withdrawn to Tunis during the summer of 2014. Perrone today told the Libya Herald in his first formal interview that his country was interested in working with all parts of Libya, not just the western Libya. However there is the perception that Rome sees its key interests, both in terms of oil and gas supplies as well over the flow of migrants, as resting in the west of the country. Italian troops are still based at Misrata airport where they have been deployed to guard an Italian army field hospital treating wounded Bunyan Marsous fighters. There has been no indication of when these units might be withdrawn. All media attempts to get near the hospital have been stopped. Khalifa Ghwell, the head of the resuscitated National Salvation Government last week demanded that Italian troops quit Libya. The migrant deal, due to be signed in Rome in the coming weeks, is likely to cover more than simply the interdiction of asylum-seekers seeking to leave the Libyan coast. Minnitti said that Italy would help Libya fight smuggling “360 degrees” and this he said, would start with strengthening Libya’s southern borders.